A team of astronomers using NASA’s Hubble Space Telescope has taken an important step closer to finding the birth certificate of a star that’s been around for a very long time. 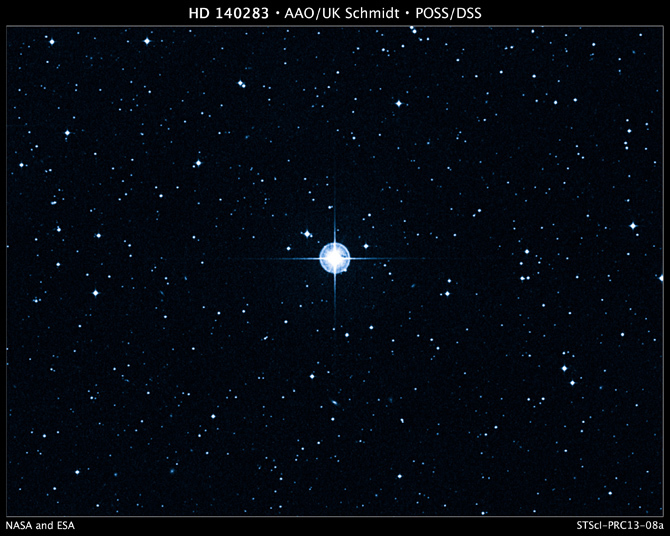 “We have found that this is the oldest known star with a well-determined age,” said Howard Bond of Pennsylvania State University in University Park, Pa., and the Space Telescope Science Institute in Baltimore, Md. The star could be as old as 14.5 billion years (plus or minus 0.8 billion years), which at first glance would make it older than the universe’s calculated age of about 13.8 billion years, an obvious dilemma. This is going to be a strom in the cosmology world, as most believe that the univsere 13.7 gigayears (billion years) old – admittedly its only an estimate, but one that will be pushed back. The new Hubble age estimates reduce the range of measurement uncertainty, so that the star’s age overlaps with the universe’s age — as independently determined by the rate of expansion of space, an analysis of the microwave background from the big bang, and measurements of radioactive decay. A small group of us went to Cairns for the total eclipse. I wanted to see and photograph the event – the experience was quite something special but alas it was plagued with bad weather. I managed to photograph before totality and after, but during totality the cloud completely covered the wondrous sight. None the less it has made me more determined to photograph totality properly in the next full solar eclipse! Totality was not visible at all – as you can view totality without the need for solar filters, all filters were removed but nothing but a black cloudy sky was visible. Only towards the end of the eclipse was I starting to get OK photos. The above photos are before totality overlooking the Cairns waterway – and the view during totality. The eclipse darkness was quite spectacular! Before the eclipse has begun it was darker than usual – similar to a partial. Being so very dark, with light in the distance around you was quite something – and an event that everyone should experience, at least once. The LHC found a boson – but was the Tevatron was there first? It was a race to find the Higgs Boson – a scientific quest that has been years in the making. The scientists at the U.S. Department of Energy’s Tevatron collider revealed their latest results on July 2nd, two days before the highly anticipated announcement of the latest Higgs results from CERN and the Large Hadron Collider in Europe. The Tevatron scientists spent 10 years gathering and analyzing data from the CDF and DZero collaborations have and announced that they’d found their strongest indication to date for the much sought after, Higgs boson particle. The team collated the last bit of information out of 500 trillion collisions produced by the Tevatron since March 2001, yet the final analysis of the data did not categorically answer the question of whether the Higgs boson exists, but it stood on the scientific precipice with a fuzzy haze of a result lying in the misty fog of data. The Tevatron was the world’s second largest proton-antiproton collider. Residing at Fermilab, the Tevatron accelerated and stored beams of protons and antiprotons traveling in opposite directions around an underground ring four miles in circumference at almost the speed of light before colliding them at the centre of two detectors. However, due to funding costs in the US it was shut down on Sept. 29, 2011. And so all data was produced prior to that shut down. The Tevatron data indicated that the Higgs boson, if exists, should possess a mass between 115 and 135 GeV/c2 ~ 130 times the mass of the proton. A few reports were leaked by CERN employees, anomalously of course, states that a discovery announcement was imminent. Then on the 4th July 2012 physicists announced that they have seen a clear signal of a Higgs boson — a key part of the mechanism that gives all particles their masses. Two independent experiments reported their results, showing convincing evidence of a new boson particle weighing around 125 gGeV/c2, which so far is the best fit for the predictions of the Higgs previously made by theoretical physicists. The ATLAS experiment has seen a new type of boson decaying into four electrons – a good indicator that it is a Higgs particle. Clearly the result is a boson but the energy-mass level is different than initially predicted – so it’s possible it may be something more exotic – maybe even Dark Matter. In any case it is a huge break through and a great change in about to come to world of particle physics. SKA Split decision – the best solution! The selection of the best site for the Square Kilometre Array (SKA), which was between South Africa and a joint Australian/New Zealand bid, surprised most people. But it makes real sense to utilize the preliminary facilities that both nations have started to contribute. In an earlier article on RelativeCosmos.com I suggested Australia would be best but in light of the split decision, it is a welcome selection! Australia will launch phase 1 of the plan and get started sooner and South Africa will come in a little later with phase 2. It really is a workable solution and it is coup for both countries’ astronomy communities – many details are yet to be finalised but it’s one of those great times where a turning point makes for great history. Square Kilometre Array (SKA) may go to South Africa but is it really the best site? Recent reports on the selection of the site for the Square Kilometre Array (SKA) have suggested that South Africa offers the best site and a panel of advisors recommended the SA site over Australia. The argument was put that the SA site was cheaper for construction, yet Australia had lower insurance fees, and primarily that the SA site was at a higher altitude. The issue of altitude is really irrelevant here for at higher frequencies water vapour, or Scintillation (the distortion of waves moving through varying densities) can become a problem, but not so much for long radio waves, the bigger problem there is radio frequency interference. Australia would be the best place for SKA, especially in WA which is ‘radio quite,’ not so in South Africa. Most long wave radio dishes are low lying. Altitude is more important for millimetre or sub-millimetre arrays. I think this is really a political issue, South Africa really needs help financially and the SKA would boost their economy. I just hope that Australia is chosen, for South Africa’s site is not as remote and within 10 years, of completion, the site could suffer considerable radio interference problems, which would seriously degrade its operational status. Some say that people who are astronomers, or students like me who will be looking for placement soon, are just feathering their nest – not true, for most of the people who will work on these sites will be from all over the world, the very cream of the crop, and probably not be Australian to a large extent. The last thing to bear in mind – Australia will soon have the NBN rolled out all over the country – this will assist the data handling to a very large extent – certainly by the time the SKA is complete we will have one of the best broadband networks in the world! THE TRANSIT OF VENUS and also the TOTAL SOLAR ECLIPSE. 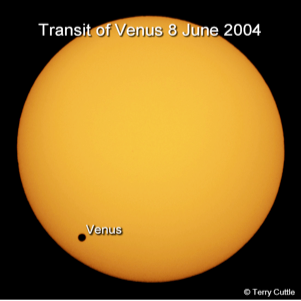 The transit of Venus is happening 5th-6th June 2012. I understand they will be doing the same thing this year… and I will be going as well. Incidentally, Jeremiah Horrocks was the first person to successfully predict and observe the transit of Venus in 1639. By November it should be dry, also Cairns gets tropical rain and as the eclipse is just after sunrise it will 95% be dry, I just hope it’s clear skies! I wrote my Essay about Moon discoveries, the title being: “Moon Discoveries & The Presence of Water” It’s a very interesting subject, and there has been many more tests and detections of water, in some form, on the Moon than most realise – so I decided to turn this essay, into a 1 hour presentation, it had to be expanded somewhat, with more photos etc., but it should go well. Disorder can greatly affect how waves travel, sometimes even causing them to stop in their tracks. A lone trumpeter on stage has no trouble projecting to the entire audience, since the sound waves from his horn travel freely in every direction. If a small amount of disorder is added, such as balloons, the sound waves can still fill the room, but if too many balloons surround the trumpeter, the reflected waves will perfectly cancel everywhere, and the music is ‘localised’ at the trumpet – lost in the forest. GOSFORD: New insight into how waves spread in different kinds of artificial materials could shed light on how disorder affects quantum materials such as superconductors. Since waves are used in all kinds of applications, from medical imaging to electronics, the physics behind disorder is fundamental to the understanding of how imperfections in the materials that compose these technologies affect wave behaviour. “While disorder and imperfections are impossible to avoid in materials, there is much we do not understand about how disorder affects their properties,” said co-author Brian DeMarco from the University of Illinois in the U.S., of the paper published in Science today. Read full news item here. Is the universe expanding asymmetrically? This image shows the two hemispheres of a spherical mapping of the cosmic microwave background. New research examining the velocities of Type Ia supernovae suggests faster expansion in the northern hemisphere of the universe, challenging the cosmological principle that the universe is expanding uniformly in all directions. GOSFORD: Recent examination of supernovae velocities suggests the universe may be expanding non-uniformly in its acceleration, which implies the laws of physics may vary throughout the cosmos. Physicists working with the Supernova Cosmology Project’s Union2 data set have suggested that the expansion of the universe seems to display a preferred axis, meaning that the universe is expanding faster in one direction than any other. 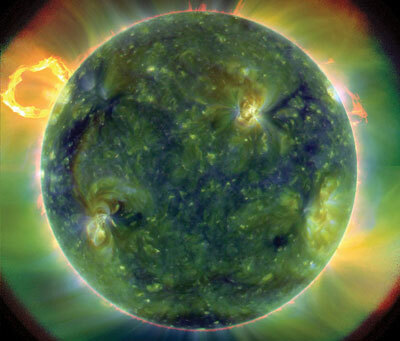 Could the Sun test alternative theories of gravity? Alternatives to Einstein’s general theory of relativity can be investigated by studying the Sun. That is the claim of a group of physicists in Portugal who have found that a variation of a theory put forward nearly a century ago by Arthur Eddington is constrained but not ruled out by observations of solar neutrinos and solar acoustic waves. General relativity, which describes gravity as the curvature of space–time by massive objects, has so far passed every experimental and observational test dreamed up by physicists. But the theory does present a number of problems. In addition to the difficulty of unifying it with quantum mechanics and the challenge to explain the nature of dark matter and dark energy, there remains the conceptual problem of singularities, where the laws of physics break down. Since Einstein introduced general relativity in 1916, many alternatives have been proposed. Last year Máximo Bañados of the Pontifical Catholic University in Chile and Pedro Ferreira of Oxford University reported a variant of a theory originally put forward by the British astrophysicist Arthur Eddington that adds a repulsive gravitational term to general relativity. This has the virtue of not requiring singularities, and as a result does not predict that the universe originated from a Big Bang, nor does it imply the formation of black holes. When considering a gravitational field within a vacuum, this Eddington-inspired theory is equivalent to general relativity but predicts different effects for gravity acting within matter. The ideal place to look for such differences would be inside neutron stars – but the interiors of neutron stars are not understood sufficiently to compare the theories. The answer, say Jordi Casanellas and colleagues at the Technical University of Lisbon, is to use the Sun. While a much less extreme source of gravity than a neutron star, the inner workings of the Sun are described accurately by solar models. Casanellas’s group has calculated that even in its non-relativistic Newtonian form, the Eddington-inspired theory should predict measurable differences in solar output compared with standard gravitational theory. The Lisbon researchers have shown that the presence of the repulsive gravity term in the theory of Bañados and Ferreira is similar to setting a different value for the gravitational constant inside matter. And with the strength of gravity higher or lower than it would otherwise be inside the Sun, the inner solar temperature is also modified because the Sun is assumed to be in hydrostatic equilibrium. This means that the inward pressure of its mass is balanced by the outward thermal pressure generated by the fusion reactions within it. A higher temperature implies a greater rate of fusion burning, which in turn implies higher emission rates of solar neutrinos. 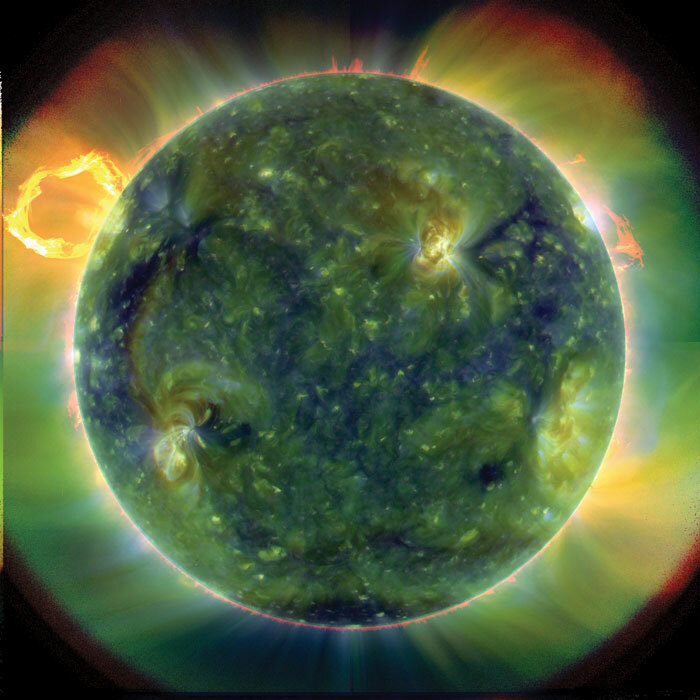 Similarly, a different strength of gravity inside the Sun implies a variation in its density distribution, which should modify the propagation of acoustic waves measured using the techniques of helioseismology. Casanellas and co-workers have shown that observations made by neutrino telescopes of the solar neutrino flux coming from the proton–proton chain reaction that produces boron-8 significantly constrain the correction to general relativity, calculating an upper limit to the effective gravitational constant. Combined with a lower limit obtained from helioseismic data, the researchers are able to put a significant constraint on the Eddington-inspired theory. However, they point out that their calculations do not rule out such a theory. The researchers say that improving on these upper and lower limits will be difficult because of uncertainties in a few of the parameters within solar models, such as the abundance of helium on the solar surface. As such, more sensitive measurements of neutrino fluxes are unlikely to have much of an impact. But they believe their approach could be used to constrain other alternative theories of gravity. Ultimately, adds team member Paolo Pani, such theories could be tested experimentally by measuring, for example, the gravitational attraction between a metal ball inserted into a hole in the ground and the mass of the Earth surrounding it. The idea would be to make the hole just big enough for the ball to fit and no more, so that what is measured is the strength of gravity through matter and not the surrounding void (in this case air). However, Pani points out that doing so would be a considerable experimental challenge. Clifford Will of Washington University in St Louis, US, described the latest work as a “nice example of using the Sun as a laboratory for probing fundamental physics” but added that “it’s not yet clear whether the bounds proposed by this paper present serious threats to alternative gravity theories”. The research is reported at arXiv:1109.0249.